What is The Story of Life? How would I use these in my class? A unique opportunity for students to learn biology through stories told by one of the great science storytellers of our time: Sean B. Carroll. This enriching text follows the structure of an introductory biology course, with brief chapters that span the breadth of the life sciences. This gives maximum flexibility to assign a few stories, or all of them. From Charles Darwin and Alfred Russell Wallace’s foundational theories to Jean Bennett and Albert Mcguire’s gene therapies. These brief stories convey the excitement of scientific discoveries surrounding life’s essential questions. How did life arise? Are species divinely created or the products of natural processes? What makes us sick? Each chapter focuses on how pioneering scientists cracked open these mysteries. The Story of Life lets students explore how great discoveries and ideas were born in a friendly, narrative format. Stories that range the entire breadth of an introductory biology course are presented in five parts: the process of science, heredity, evolution, ecology, and physiology. This gives you many flexible options for which stories to assign and when. Looking for ways to ensure students read? The review and thought questions throughout help students assess their understanding. They’ll review key experiments as well as discoveries and ideas. A thorough Instructor’s Guide provides story overviews, suggestions for classroom discussion, references to using the HHMI BioInteractive films as enrichment, and more. Storytelling is a powerful but underutilized way of learning science; why the particular stories in this book were selected. How the scientific process works, and what can happen when it is undermined. Robin Warren’s and Barry Marshall’s revolutionary discovery and unorthodox demonstration that H. pylori is the cause of ulcers. Do vaccines cause autism? The story of the physician who raised the alarm about a link between vaccination and autism, and then how that claim has been tested and affected vaccination rates across the world. How does like produce like? The stories of three seminal discoveries that revealed the physical basis of heredity, and the strides being made today to correct human disorders with gene therapy. Where does genetic information reside? The story of T.H. Morgan and collaborators’ experiments in fruit flies that proved the chromosomal basis of heredity. 4. Who Would Have Guessed it? Frederick Griffith and Oswald Avery’s experiments in bacteria that culminated in the key evidence that DNA is the chemical basis of heredity. James Watson and Francis Crick’sbold and ultimately successful quest to solve the structure of DNA that revealed how genetic information could be faithfully replicated from generation to generation, and evolve by mutation. The story of Jean Bennett and Albert Maguire’s quest to correct blindness with gene therapy. Evolution is said to be the biggest idea humans ever conceived. 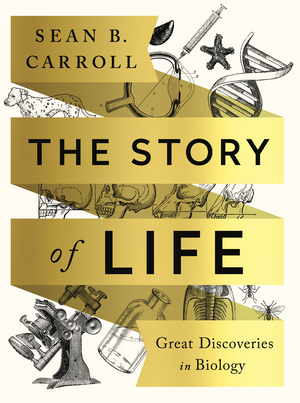 This section presents the stories of several pioneers who first illuminated key chapters in the story of life, and the origins of species, cells, animals, and humans. The epic journeys of Charles Darwin and Alfred Wallace, and the similar patterns of observations that lead them to independently propose the theory of evolution by natural selection. When and why did animal life first flourish? Charles Walcott’s discovery of a huge deposit of fossils in the Canadian Rockies that document the so-called “Cambrian Explosion” of animal life over 500 million years ago. How did complex eukaryotic cells evolve? The story of the radical theory championed by Lynn Margulis that eukaryotic organelles arose from symbiotic bacteria. The stunning discovery by Carl Woese and colleagues of the Archaea, an entire domain of life that was overlooked by biologists for decades. The adventures of Mary and Louis Leakey, whose discoveries of early hominids at Olduvai Gorge, Tanzania demonstrated that Africa is the cradle of humanity. The stunning discovery by Svante Pääbo and colleagues that many people retain a trace of Neanderthal ancestry in their DNA. How does nature work? This section features some of the first experimental approaches to ecology that revealed surprising truths about the factors that shape ecosystems and the environment, and that are the scientific foundation for modern environmental stewardship. The adventures of Charles Elton, who described the first food chains, revealed how food is the currency in the economy of nature, and founded modern ecology. 14. Why Is the World Green? Robert Paine’s pioneering experiments that overturned thinking about the roles of predators in communities, and spurred new conservation strategies. What determines how many species live in a given place? The story of E.O. Wilson and Daniel Simberloff’s experimental test of the theory of island biogeography, and its application to conservation. The discovery by Charles Keeling of the increasing concentration of carbon dioxide in the Earth’s atmosphere, and the potential consequences for the planet. How do the body’s complex organs and systems function? The mysteries of development, immunity, and the brain have been penetrated by a few seminal experiments and discoveries, with profound implications for medicine. The surprising demonstration by John Gurdon that mature somatic cells can be reprogrammed to generate a cloned animal, and Shinya Yamanaka’s discovery of the molecular recipe for reprogramming. How does the body mount a specific immune response to any and all foreign invaders? The story of Susuma Tonegawa’s discovery of the molecular basis of antibody diversity. How does the brain work? The story of Roger Sperry’s pioneering studies of human split-brain patients and his discovery of the different roles of left and right hemispheres.